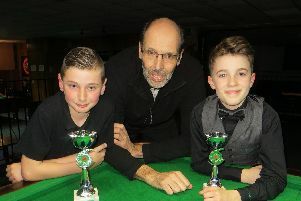 A nine-year-old from Havant has passed the landmark 30-break milestone. Owen Jenkins compiled a personal best 37 against defending champion Dean Russell in the Wednesday Junior League at Waterlooville Sports Bar. Competition organiser Tim Dunkley said: ‘This was a remarkable achievement. It’s not a record but it is extremely rare. Jenkins also competes on the Cuestars South of England Under-21 Bronze Tour. Meanwhile, former champion Samuel Laxton lost his first match to Russell but still won the first of the four round-robin groups and extended his lead at the top to five points. Lennox Anderson heads division one, while Tyler Mack is top of division two. Cuestars Gold Tour player Arron Smith knocked in the highest break of 64 in his first match against Jenkins in the Monday Junior League. Smith, conceding a 30-point handicap, won the top group. At the halfway stage of the season, Harry Wilson leads defending champion Zak Truscott by three points. Henry Martin was undefeated in group two.